STUCK IN THE MEDICAL CYCLE? Trying to avoid surgery but rest and rehab aren’t working? You’re not alone. This is the typical path faced by most athletes. YOU are the culprit causing your own pain. Your improper movements, incorrect posture, and poor training habits have led you to a place of pain and injury. Once we are injured we rely on medical doctors to tell us what to do to heal. This is where the disconnect begins. Doctors are structural experts who rely on physical therapy (PT) to return your body to "proper" function. But ask most doctors if they believe PT works, and the answer is a resounding, “No.” PT can sometimes offer short-term pain relief, but it is typically a slow process and can never really fix the underlying issues causing the injury or pain. Traditional therapy of rest, “stim” and ice just doesn’t cut it. 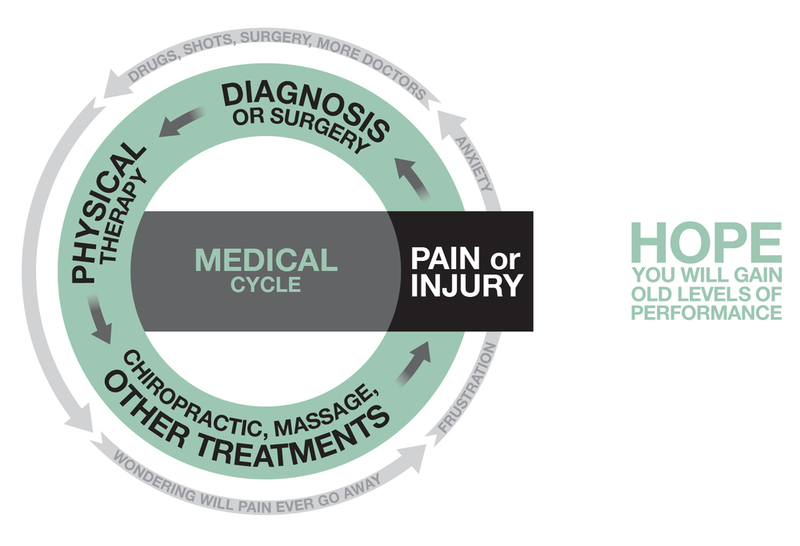 Medical doctors might also recommend a chiropractor, nutritionist, personal trainer, an Eastern practitioner … the medical cycle could be endless. Unfortunately, all of these practices may be outside of the doctor’s expertise, and none of these specialists is looking at the whole picture that reveals how improper movement may be causing your pain. Nobody is looking at muscle imbalances that can cause pain and, if not properly addressed, can eventually lead to injury. While the so-called specialists struggle to fix you, only DAG provides the knowledge and expertise you need to look at the entire picture. Our unique philosophy and training techniques – not practiced anywhere else in the world – break the Medical Cycle and help you achieve proper posture, muscle alignment, and optimal performance. DAG breaks the repeated cycle of pain and injury that leads you back to doctors who fail to alleviate your symptoms through injections or surgery. We’ve invented a new approach to sports medicine. We examine every movement your body makes to gain a better understanding of how misuse of your muscles has caused your structure to change. Doctors attempt to change your structure through invasive surgery requiring extensive post-surgical recovery before you can even begin rehab. We change your structure through a proprietary and non-invasive system that includes proper assessments, pain relief methods, and corrective exercises – all in house. If you break a bone you need a surgeon. But if you feel pain and keep getting injured then it’s time to let DAG look at your muscular recruitment and movement habits to get to the core of your problem. We’ll help you return to pain-free play and experience a level of performance you’ve never achieved before.